Pineapple is one of them most underrated sandwiches ingredients that I can think of. Why not break out of the ordinary and create one of these tasty tropical sandwiches. 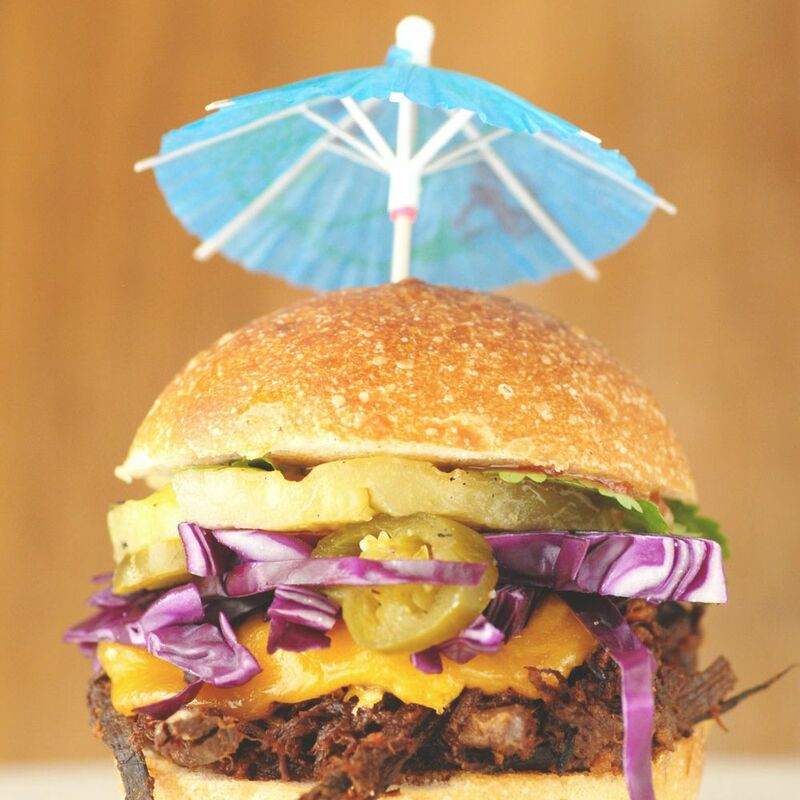 This fun and sassy Hawaiian sandwich features my basic slow cooker brisket recipe and is made by tossing the brisket with teriyaki sauce and then adding fresh grilled pineapple, spicy pickled jalapeno slices, melty sharp cheddar cheese, crispy red cabbage and fragrant cilantro between two halves of a sourdough bun. To change it up a bit, add some mango with thai chili, or try swapping the cheddar out for brie and adding plantains instead of pineapple. I'd recommend serving this alongside a margarita or a pina colada while relaxing on a beautiful beach somewhere. Or at least imagine eating this on a beautiful beach somewhere... Rather than up here in New York where it's cold and miserable. Grabbing a slice of pineapple and ham pizza is nothing out of the ordinary, but what about transforming that dish into an exotic grilled cheese filled with sweet vibrant chunks of fresh pineapple, spicy rings of pickled jalapeños, milky strands of melted mozzarella and a umami-esque tomato sauce. All these ingredients melodically combine to help pack this hawaiian pizza style grilled cheese full of flavor. Want more protein? Add some ham or pepperoni – Either way, this sandwich is to die for. To read more about this recipe or to view step-by-step photographs, please feel free to visit this post on my blog at GrilledCheeseSocial.com right [HERE]. Comte is one of my favorite cheeses to use on sandwiches. Not only does it melt perfectly but its got a sweet and nutty bite that lends well to just about everything. When it's melted down with sweet and tart fresh pineapple and savory rosemary-infused ham, the flavors of this cheese intensify and become even better. To see the original post or to view step-by-step photographs of this recipe, please visit my blog GrilledCheeseSocial.com by click [HERE].